The Fire Box is configured in “Fire Mode” and hooked up to an electrically fired pyrotechnic device at a designated location. The Battery Box is placed in a second location. 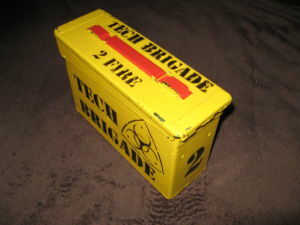 The attacking team have to locate the Battery Box, take it to the firing box, connect the two together, insert the Safety / Arming Key, Arm the box and press the Fire Button to set off the pyrotechnic device. The two boxes can be hidden separately and the “charge” planted and wired to a safe firing point, The attackers have to get both boxes to the firing point and hook up the “charge” to the firing box as well as connecting the two boxes together. The Battery Box has a key and Firing Box has 2 keys. The keys can be allocated to either attackers or defenders so that they either: have to be captured to be used; captured to be prevented from being used or so that only “high value targets” can operate the boxes. The interconnecting cable can be used as an additional critical part. 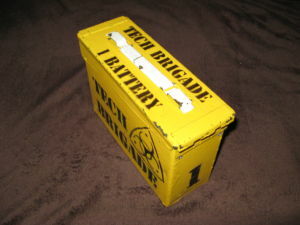 Box 1 – Battery Box and Box 3 – Alarm box. This is the simplest mission setup. 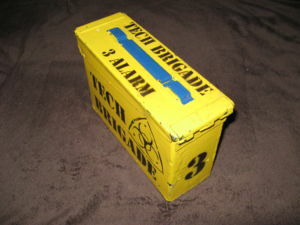 It is the one most regularly used at Tech Brigade.The attacking team have to locate the Battery Box, take it to the Alarm box (or vice versa), connect the two together and throw the “Fire” Switch to set off the alarm. The two boxes can be hidden separately. The attackers have to get both boxes to a third point to set off the alarm. The Battery Box has a key and Alarm Box has a keys. The keys can be allocated to either attackers or defenders so that they either have to be captured to be used, captured to be prevented from being used or so that only “high value targets” can operate the boxes. The Fire Box is configured in “Switch Mode”. The Battery Box is placed in a second location. The Alarm Box at a third location. The attacking team have to locate the Battery Box and the Fire Box, take them to the Alarm, connect the three together, press the Arm Button in the Fire Box and the Fire Button in both the Alarm Box to set off the alarm. The the three boxes can be hidden separately, The attackers have to get all three boxes to a fourth point connect all three boxes together. The Battery and Alarm boxes can be hidden separately and a charge planted and wired to a safe firing point with the Fire Box, The attackers have to get Battery box to the firing point connect the two boxes together Fire the charge. Then take the Battery Box and Fire Box to the Alarm box, connect the three together, switch the Fire box to switch mode then throw the Fire switches. The the three boxes can be hidden separately and the charge planted and wired to a safe firing point, The attackers have to get the Battery Box and Fire Box to the firing point and hook up the charge to the firing box as well as connecting the two boxes together. Then take the Battery Box and Fire Box to the Alarm box, connect the three together, switch the Fire box to switch mode then throw the Fire switches. The Battery Box has a key, the Firing Box has 2 keys and the Alarm box has a key. The keys can be allocated to either attackers or defenders so that they either have to be captured to be used, captured to be prevented from being used or so that only “high value targets” can operate the boxes. The interconnecting cables can be used as additional critical parts.